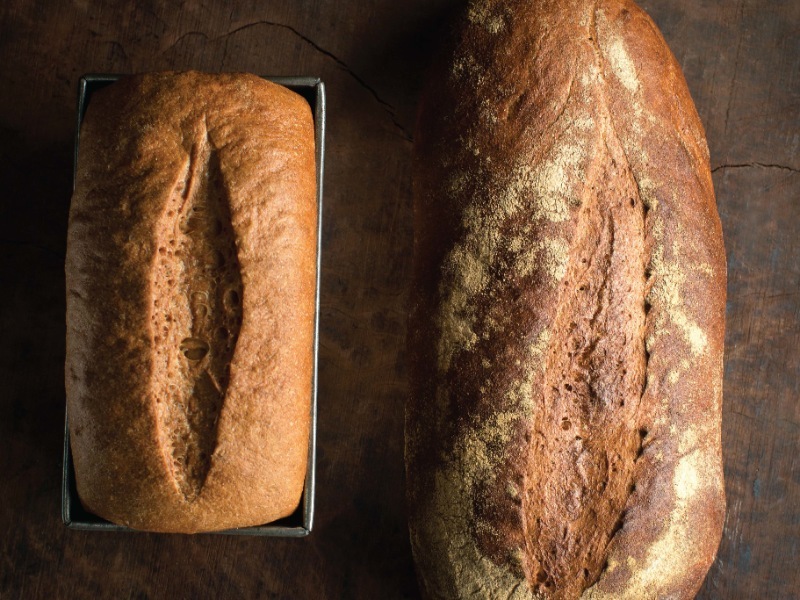 Peter Reinhart's new book, Bread Revolution, is focused on breads made with sprouted grains and sprouted grain flours. Below is one recipe from the book reprinted here with permission. 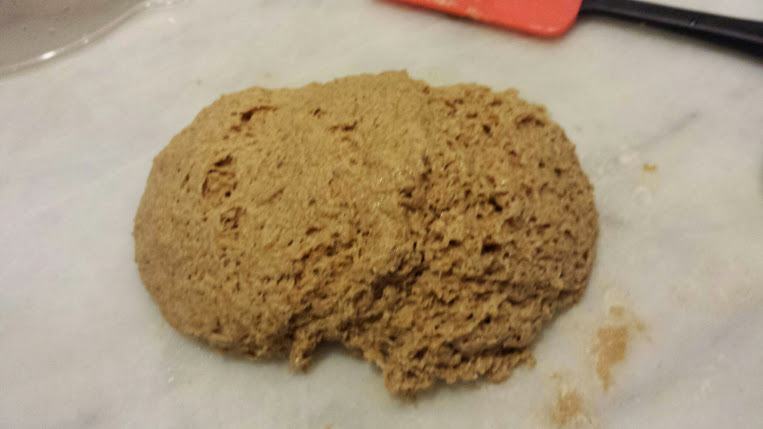 This master dough can be used to make bread in any shape or size. It showcases the natural sweetness and tenderness of sprouted whole wheat flour without any added oil, fat, or other enrichments, such as milk, eggs, or sweeteners. Sprouting the wheat changes it so much that many of the "rules" for artisan breads, such as using pre-ferments and long, slow rising times, are unnecessary. The aims of those techniques can be achieved in less time with sprouted flour because the sprouting phase has already accomplished what pre-ferments and long fermentation typically do. I suggest that you make this bread before attempting any of the more elaborate recipes that follow. 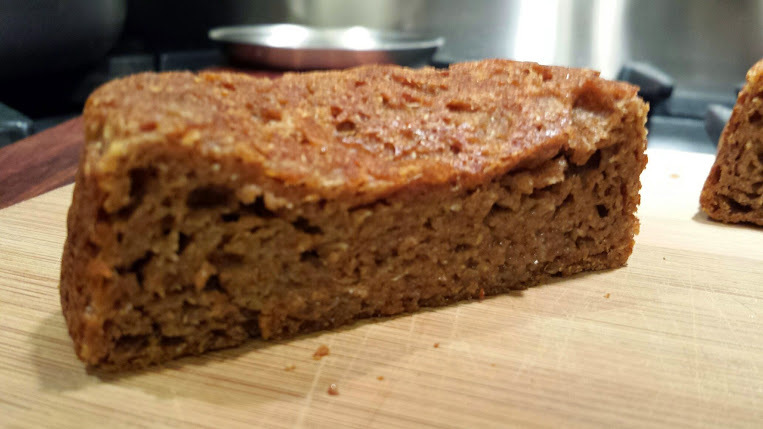 This will familiarize you with the flavors and performance of sprouted whole wheat flour. In fact, it may be the only recipe you need for everyday breads, as it works equally well as a loaf pan bread and a crusty hearth bread. 1. In the bowl of a stand mixer fitted with the paddle attachment, or in a large bowl, stir together the flour, salt, and yeast (on low speed if using a stand mixer). Add the water and mix or stir until the flour is hydrated and a coarse, wet dough forms, about 1 minute. Don’t add more flour, as the dough will thicken while it rests. 2. Let the dough rest, uncovered, for 5 minutes. Then switch to the dough hook or use a wet spoon or wet hands and mix for 1 minute, on medium-low speed if using a stand mixer. The dough should be smooth but still very soft and sticky (similar to ciabatta dough). Add flour or water only if necessary to achieve that texture; the dough will firm up as you continue to work it. 3. Spread about 1 teaspoon of vegetable oil or olive oil on a work surface. Using a wet or oiled bowl scraper or rubber spatula, transfer the dough to the oiled area. Lightly oil your hands, then stretch and fold the dough as shown on page 20, folding it over itself four times: once each from the top, bottom, and sides. The dough will firm up slightly but still be very soft and somewhat sticky. Cover the dough with the mixing bowl and then, at intervals of 5 minutes or up to 20 minutes, perform three additional sequences of stretching and folding. For each stretch and fold sequence, lightly oil your hands to prevent sticking. The dough will firm up a bit more with each stretch and fold. After the final fold it should be soft, supple, and tacky and have a springy or bouncy quality when patted. 5. Oil the work surface again and use an oiled bowl scraper or rubber spatula to transfer the dough to the oiled area. For hearth loaves, prepare two bannetons or a couche as described on page 26. Divide the dough in half and shape each piece into a boule or bâtard as shown on page 21, then put the shaped loaves in the prepared proofing vessels. For pan loaves, mist two 4½ by 8-inch loaf pans with vegetable spray oil. Divide the dough in half and shape the pieces into sandwich loaves as shown on pages 23 and 24, then put the shaped loaves in the prepared pans. For rolls, line two sheet pans with parchment paper or silicone mats. Divide the dough into the desired number of pieces and shape as desired (see page 24). Put half of the rolls on each lined pan. 7. To bake a hearth loaf, about 45 minutes before you plan to bake, prepare the oven for hearth baking with a baking stone and steam pan as shown on page 29, then preheat the oven to 450°F (232°C). Transfer the shaped loaf to a floured peel (or keep it on the sheet pan for baking). Score the top as desired (see page 29). Transfer the loaf onto the baking stone (or put the sheet pan on the baking stone). Pour about 1 cup of hot water into the steam pan. Bake for 15 minutes, then rotate and bake for 15 to 20 minutes longer, until the loaf is golden brown on all sides and sounds hollow when thumped on the bottom. The internal temperature should be about 200°F (93°C).Transfer to a wire rack and let cool for at least 30 minutes before slicing and serving. 8. To bake pan loaves, preheat the oven to 375°F (191°C); steam is optional. Bake for 25 minutes, then rotate and bake for 25 to 40 minutes longer, until the bread is golden brown all around, the side walls are firm and not squishy, and the loaf sounds hollow when thumped on the bottom. The internal temperature should be at least 190°F (88°C). Let cool in the pans for at least 10 minutes, then transfer to a wire rack and let cool for at least 20 to 30 minutes longer before slicing and serving. 9. To bake rolls, preheat the oven to 400°F (204°C); steam is optional. Bake for 12 minutes, then rotate and bake for about 10 to 15 minutes longer, until the rolls are golden brown and sound hollow when thumped on the bottom (they will soften as they cool). The internal temperature should be about 190°F (88°C). Transfer to a wire rack and let cool for at least 10 minutes before serving. NOTE: If it is more convenient for you to use an overnight method, put the covered bowl of dough in the refrigerator immediately after the final stretch and fold. The next day, remove it from the refrigerator 2½ hours before you plan to bake. Shape the cold dough and proof it at room tempera¬ture until it increases in size by 1½ times, then bake as directed. Reprinted with permission from Bread Revolution by Peter Reinhart (Ten Speed Press, © 2014). Photo Credit: Paige Green. Bread Revolution is available now from Amazon, Powell's Books, Amazon.ca, or your local bookseller. He tries to keep everyone happy, the volumetric, the two weight systems, and the baker's percentage. I never understood any of it until BBA introduced me to baker's percentage. Then with the ratios, "recipes" started making more sense. Looks appetizing! It's amazing that it has 90% hydration and has that nice curved top, "Because the dough is so hydrated, it’s fragile and will fall if you proof it until double in size. It’s better to bake it while it’s still on the rise." Those look delicious, Floyd! Thanks for taking the permission and time to share it with us. I might want to buy this book. I don't know when I 'll be able to get hold of sprouted flour, let alone making it, but when I do.. I;m sure i'll love the bread that it makes. I have this book on my wishlist. This loaf looks nice. Thanks for sharing! I bought the book last week and am trying to decide whether to buy a mill for dehydrated sprouted wheat. Flavorwise what's the sprouted wheat bread like? I just bought the Komo Classic mill after saving all my gift money for 3 years. Breadtopia.com gives a 10% off on the weekend after Christmas and they had the cheapest price. Thanks for sharing Floyd. I'm trying to decide on the Kindle version or the hard-copy but I'm getting this one for sure. Pizzafool, I just got the book, so I haven't tried the recipes yet. I started working with sprouted grain flour mixed with non sprouted flour some time ago, and the taste was amazing, though I had some problems with the loaf coming out of the oven in good shape, but falling a bit as it cooled. I am hoping the recipes will solve that problem. I got a mill for the health benefits of whole wheat, and haven't looked back. I went to a baking class that made baguettes and ciabatta from AP flour, and after eating whole wheat for so long, the AP tasted very empty. If sprouted grain, you can use any mill, but a stone mill will be a little safer - if the grain is moist and you use an impact mill like the Nutrimill or Wondermill, you could have some problems. With a stone mill, at worst you take it apart and clean the stones and you are back in business. Highly recommend you look used, new stone mills are pretty expensive. Thanks, Barry, that's really helpful. My midlife crisis seems to involve grinding things. And eating. So has anyone baked this Reinhart recipe or anything from his new book? I am curious how the taste of these breads compare with brad made from more traditional flours. I have made several attempts, both before and after getting the book, the taste is quite good, the results from the book have been poor, though I can't blame any of it on the book. First, I have been buying my own wheat berries and grinding them for years. I started sprouting some, then drying, then grinding a few months ago. If I used 100% sprouted winter white wheat berries, the taste was incredible, but the loaf collapsed within a few minutes of coming out of the oven. I finally got results that would not collapse by dropping back to about 30% sprouted flour - the taste was good, but not as great as 100% sprouted. Since the book has come out, I tried using winter white berries a few times, and mostly the results were very poor. The loaf came out of the oven maybe 5 inches high, and flattened to about 2 inches or less within 1 /2 hour. I took photos, but it doesn't come out. I then read the section of the book that said you need high strength grains, so I switched to red spring wheat berries. I made a few test loaves, and got slightly better results, but instead of a light batard, I still got a loaf that was nicely risen in the oven, but fell as it cooled. My last test, I added a little VWG, though it is not called for in the recipe, and that did slightly better. Taste is quite good, but shrank quite a bit. In fairness, the recipe states that the loaf should raise 1 1/2 times in volume before it is baked, and my last two were definitely closer to doubled in volume, and he warns that it can fall if overproofed. I have just sprouted then dried another set of red, and will try again. I would also say that when I dried the first few sets of berries, I used a convection oven set at 90 degrees. Reinhart says that you should not even have the light on in the oven, so it is possible I am damaging it with the way I am drying the sprouted berries. This most recent attempt, I put the berries in perforated trays in a gas oven with the fan only ( no heat or light ) for 24 hours . I then milled them in a Lee Household Mill. They were still far too damp, and I ran into some problems, though I did get some ground flour that I will try this weekend, the Mill got pretty clogged up. Fortunately, it cleaned up pretty well and didn't take too long. I plan to post in the grains and milling section once I get more positive results. So far one edible failure using One Degree Organic Sprouted Wheat Flour. I definitely overproofed - my kitchen is cold and drafty so I resorted to oven with pilot light and the microwave with hot water to proof. I so much prefer proofing in the fridge, but not sure that'd work. Very bouncy dough at 90% hydration! Flavor was pretty insipid and vegetabley, but I can't blame the recipe without lots more testing - and maybe the flour is old or who knows? I'm not going to make the bread unless it tastes good - forget health benefits if nobody likes it! I also used the stone and steamer tray like I used to do with PR recipes, but next time I'll go for the Dutch Oven, as I much prefer that method. I posted about mine he other day. I made the sprouted Pain Au Levain with home ground winter wheat berries. No oven spring and gummy center. Still not sure where I went wrong. Will try again this week. I am at failure 4 or 5, sort of lost count, again only using berries that I sprouted myself, then ground. This time I added a tablespoon of VWG to a half size, 226 grams of sprouted flour. After 5 minutes of kneading in my mixer after the suggested rest, it looked pretty good, though very wet, and did two sets of stretch and fold and set it to proof. ( I had planned to go out for a while, so I did not think I would have the time to do all 4 sets, but figured I made up for it with the extended kneading time). By the time it had nearly doubled in size, it looked like goop - no structural strength and tons of holes in it. I did a few S & F, which helped tighten it up a little, then let it proof for about 1/2 hour in a small bread pan, hoping that would help the collapsing issue. Then baked and got it out of the pan and let it cool , probably should have let it cool in the pan. It did not collapse as much as some of the prior attempts, but no oven spring, very gummy, and a sag as it came out of the pan, though not as dramatic as last weeks attempt. Smells great. Tomorrow I will try lowering the hydration - could be that home ground berries need less water than the store bought sprouted flour. I did not have any issues with it collapsing. I would definitely decrease the amount of water and also slightly underproof the loaf instead of letting it double and that will probably solve the collapsing issue. Let me know how it goes. I'm going to start sprouting again today and hopefully bake in the next few days. I tried leaving a comment on Peter's blog but have not received any feedback. Hopefully he will see this and maybe some other comments and offer some suggestions. Floyd if you are reading this, please see if you can reach out to Peter and ask him to offer some help. Thanks. I just baked my first loaves with one degree sprouted whole wheat flour. Like others, I am sure that I over-proofed them. The dough took so long to rise that I thought the loaves would also take at least 2 hours to get to 1.5 times their size. Instead they were probably ready to bake much earlier, but I had gone out and my oven had not been preheated. i will report on taste and texture in my next post. i am happy to report that the taste and texture were very good. I followed the pain au levain recipe exactly as written using 1/4 tsp. yeast. It should be noted that much to my surprise this recipe included only a part of the levain developed for the recipe, so it might be important to make sure that only 92 grams of levain be included in the recipe. I definitely will bake this again, but pay close attention to rising times. i hope some of you will try this again. It may be that since I used a commercial product instead of a homemade sprouted flour that I got results more similar to Reinhart's. EDITED : As a result of a later test, I am pretty sure that the 1 TB of VWG caused the very gummy texture in the sprouted loaf. and followed the instructions for overnight refrigerated proofing. It looked a little better going into the fridge. In the morning, it had risen about 20 %, but the holes on the insides of the container looked bad. 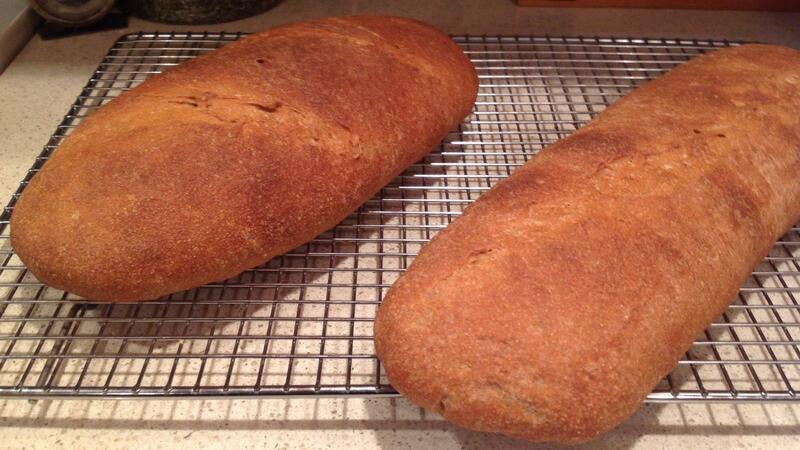 I also made a second batch in the morning using 35% sprouted flour, and the rest red spring milled wheat, but no VWG. The instructions said to take the refrigerated dough and let it sit out on the counter for 2 1-2 hours. At the end of that time it did not look like it moved at all, and the 35% sprouted had risen a bit after some time in a proofer, but looked much better. The whole surface was pocked with holes, and I could not get any surface tension - as you pulled it it came apart. I added flour and did the best I could. The 35% sprouted flour formed much better. I took a small amount of the 35% sprouted and put it in a small straight sided container to be sure I was not overproofed, and set both loaves to proof. When the 35% loaf had increased about 30 to 40 % in volume, the 100% sprouted had flattened out like an oatmeal cookie. I know this is hard to believe, but it looked even worse when it came out of the oven. This is where I lifted up a part of the surface. The 35% sprouted grain came out with a little bit of spring, but collapsed in the middle ( both ends held their shape pretty well ). This is a photo comparing a slice near to the end ( the loaf on the right) with one in the middle. I know it looks very gummy, it was just over 200 with a thermapen when I took it out of the oven. I put 1000 grams of red spring berries in water tonight and will work on sprouting another set. i am guessing that your "home-grown" sprouted wheat is just very different from the commercial variety and behaves differentlLy. You might want to buy some to compare and try to discover what is different. I have been experimenting with sprouted grains too and have not had the issues others are mentioning here. I have simply been replacing my usual freshly milled grains with ones that I have sprouted, dehydrated and then milled and they have worked in all of my loaves thus far. Here is a link to one of txfarmer's write up that I follow in terms of how much pre-fermetnted flour I use and the schedule I use for fermenting the dough. The only difference has been that I place my doughs right into the refrigerator once they have been mixed to proper gluten development. I am using Prairie Gold Hard White Spring berries as well as spelt and rye berries as per needed for whatever formula I am working on. When sprouting my grains I dehydrate them as soon as I can detect the first hint of a white sprout appearing from the grain. They are dehydrated at approx. 105° for 4-6 hours. I can't comment on flavor since my loaves are given to others and I haven't heard back. Thinking that since my loaves generally contain spice or enrichments the flavor difference may be not as noticeable….Time will tell. Janet, thanks, I am sprouting my next batch, and just started getting the white shoots about 1/8 inch long or less, and will dehydrate and see how they do. In the book. Reinhart suggests you wait until the sprout forked, but I am not sure if I understood what he meant, and may have let them sprout too long. Here is a link to a blog with a photo of the sprouts just beginning to show. This is the stage where I dehydrate rather than proceeding further as she does. I am not sure what difference it makes but was told that the longer the sprout grows the more nutrients it is taking from the grain which makes sense to me. The forking stage happens a bit after the budding stage pictured. You might want to experiment with stopping at different growth stages to see what happens as the grain continues to sprout. what % of starter are you using with your 100% sprouted breads? I believe you are doing an overnight bulk retard too, right? Yes, I do an overnight bulk fermentation following txfarmer's method which I linked above that goes into times and amounts and kneading method. I use 15% pre-fermented flour which is fed with YW (HL approx. 75%) over 2 builds during the day approx. 3-4 hours apart. and wondering why the author calls the "3 pronged sprout" a sprout? The "three prong sprout" pictured is a rootlet, the sprout I do not see. Can someone clarify? Thank you...thank you ! Will be milling sprouted flour today and giving recipe another go. I'm going to try a few things different and see if it works better. Stay tuned. i just want to be clear that when i made my pan au levain bread using commercial sprouted whole wheat with Reinhaert's recipe, I did not do an overnight fermentation. I allowed the dough to ferment 8 hours and proofed the loaves for about 1 hour and then an additional 45 minutes in the refrigerator when I realized that the loaves were already over-risen and my oven and stone had not been pre-heated. Third times a charm. I finally figured it out....I think :). It was my sprouted flour....did not dry sprouted grains long enough. You can see my results here : http://mookielovesbread.wordpress.com/2014/11/19/sprouted-wheat-pain-au-levain-bread-revolution/ or on the Fresh Loaf blog. Bread came out real tasty with a moist crumb and not gummy like previous version. Ian, that is a great looking loaf. I did not dry my sprouted grains long enough for the last test, but dried the current batch pretty well. I did find, however, that I need to start drying sooner. This time I dried at 90 degrees in a convection oven, and the amount was so much that it took nearly a day. ( I had set the oven for 3 hours, went to work and came back from work, and set it for another 3 hours, then went to back, and finally hit it one more time in the morning). During all that time, the sprouts continued to grow so they were much longer than when I first started to dry them. I had assumed that they would stop growing once I started to dry them, but now it looks like they keep growing a while longer. Thanks. Look forward to seeing your results. I used a fan and no heat to dry them on a perforated cookie sheet. No additional growing. Best to not let them grow tok much. i am pleased to report that my second attempt at this bread seemed to behave so much better. I was more careful to limit the bread proofing time to about 43 minutes plus I shaped only one loaf with the dough. If the taste/texture pans out, I will double the recipe the next time I make this to get 2 large loaves out of it. Sprouted wheat flour in Canada mail order?? Hey Floyd, do you know any on-line mail order source for sprouted wheat flour in Canada? King Arthur sells it the the shipping and brokerage make it expensive. Anybody??? I was in Whole Foods yesterday and noticed they had Anita's Sprouted flours too. Just reporting back, I have baked a few more loaves, having fully dried the sprouted grains before putting them in the mill. 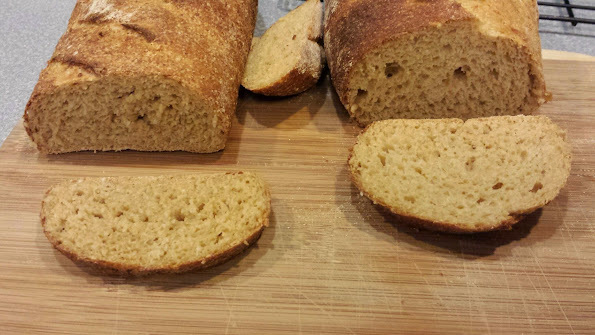 I tried one loaf with 1 TB of VWG, and one with 1 teaspoon of VWG to compare the results. The very gummy texture was in the loaf with 1 TB, and the loaf with 1 tsp was much less gummy - so I think the VWG was to blame and will leave it out in my next trials. On my most recent batch, I started drying as soon as the first white appeared at the end of the berries - probably about 1/8 inch, so I hope to get better results. Much of what has been posted in this thread, whether photographs or written descriptions, seems to point to diastatic activity in the sprouted grains. Granted, there isn't supposed to be, but...sprouting is the beginning of malting. Unless one has a very tightly controlled sprouting process and can guarantee that the resulting sprouted grain's enzyme levels are between x and y boundaries, it seems to me that there is a fairly high probability that the sprouted grain has more diastatic effect than desired. Especially if the drying is done at low enough temperatures that the enzymes in the grain are not deactivated. Keep in mind that I'm an observer standing on the sidelines. Maybe there are things that those of you with your hands in the dough are seeing that would argue against my observations. Still, there's an awful lot that looks and sounds like starch degradation going on in the problem bakes that have been discussed here. It's very difficult to get the sprouting just right imo. It's not just a case of simple timing and observation. The problem is that individual grains sprout at different points. Some grains will have budded before others. If you wait till all grains (or the vast majority) have budded then there will be a % that have begun sprouting tails. 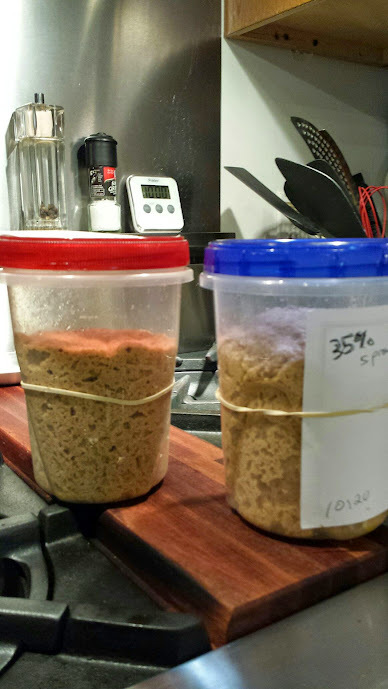 The normal timings and "rules" of baking need adjusting for sprouted flour imo. The concept of mixing and then leaving to double in volume has to be thrown out of the window. The dough progresses, in my experience anyway, too quickly to wait for it to double. That could simply be the result of over-sprouting the grains in the first place. So I go more by time and feel than by volume. Waiting for it to double in volume can result in the degraded dough full of holes that tears away as others have reported in this thread. My first batch of sprouted spelt took about 4 days to get to the point I thought was needed before I then began drying them in the dehydrator. The second batch took just 2 days and for this I just waited for that tiny litle shoot to start to appear for most of the grain. With the frst batch I made a boule with 50% sprouted flour and 50% strong bread flour with no problem at all. With the second batch I was able to make a good boule this week with 50% sprouted spelt, 10% sprouted rye and 40% strong bread flour. So I'm still edging the % of sprouted grain upward but honestly, at this juncture, it feels like a 100% sprouted would be unattainable if one was expecting to be able to make a typical blooming boule with good height and structure. I guess I could sprout the grains even less. i.e. just give them maybe 1 day to 1.5 days of sprouting and dry them before they even start shooting, just trusting that the germination processes have begun inside the grain. I wonder however in that scenario, whether the processes will have progressed enough to provide all the extra nutrition we want from the whole sprouting process. So overall, this is still a work in progress for me and it's interesting to see how others are progressing. 24 hours is the mx sprouting time fir me. The rye wheat and spelt grains are chitted by then but each different. I can get a really good loaf using 30% sprouted and a 12 hour retard and a 15% SD preferment. But over that amount of sprouted grain the you have to start going down in preferment and retard to 8 hours. For 100% sprouted grain you wouldn't be able to retard at all in my book without having a pile of over proofed goo in the morning. Better to just develop the gluten, do a short bulk ferment, shape and proof on the counter till 85% proofed and then in the oven it goes. My next test was a step in the right direction, but barely. I sprouted till the shoots were about 1/8 inch ( though they sprout at different speeds, so some were longer ) and then started drying at 100 F and dried until they were very hard. Then I followed the directions very closely, did not add any VWG or vitamin C, a short mix, then a series of stretch and folds, then into a proofer at 90, and waited for the sample in the small straight container to nearly double in volume. The dough looked pretty normal through all of that. Then shaped into a batard. I gave it a short final proof, around 30 minutes, it rose a little, but spread more than it rose, then into a hot oven with steam. I got a little bit of oven spring and it looked not too bad coming out of the oven. Within a few minutes it started drooping. This is the shot after it cooled. You can see that the lowest part did rise, then fell under the weight of the rest of the loaf. You can also see that it has wrinkled on top, especially on either side of the hole in the top center. This is the best looking part of the loaf, the rest has sagged quite a bit more. The taste is pretty good, but it is not something you can offer to a friend, the bread is still a little gummy, and has a very squishy feel. Next attempt will be to set the proofer to the temp recommended by Reinhart and use his timing to see if I can eliminate overproofing. I'm looking at your sprouted grain picture and wondering if you've left them way too long. The key to all of this imo is bare minimal sprouting otherwise the grain structure and resulting flour has changed too much. I would bet that with your flour, you could make say a 50/50 sprouted flour/white flour loaf with no problems. I suspect that the sprouting process needs to be just a few hours soaking in the dark (say 5-10hrs) and then dry immediately in a dehydrator. I doubt you would see any shoots or tails at all, but presumably the water will have triggered the germination processes inside the grain anyway. I will be testing my next batch this way. Elpandero, a shorter soak time is next. I just made another loaf with the exact timing and temps from the book, and it was pretty bad, very little oven spring, and it came out extremely dense and gummy, worse than the last attempt. I assume it must be the flour. The last time I followed his directions, a 3 hour soak, then a rinse every 12 hours. but I will try again and try to dehydrate sooner. Before the book came out, I had experimented and got to about 30% sprouted without problems, but I was using winter wheat, which is not as strong as spring wheat. I used the recipe exactly as posted in grams, using the same flour from Lindley mills that Peter developed the recipe for. Despite the skill necessary to work with a very wet hydrated dough, the hearth bread came out perfect. The crust and crumb was very good. The texture of the crumb is soft and smooth, unlike anything I have tried before. Also made some pancakes from a recipe off the Lindley mill website, using this Supersprout flour. They were to die for!! I am about 1 hour 15 minutes from the mill, so I picked up a couple of bags of flour, one being the sprouted wheat. I can imagine using this for most of my baking onward. "SuperSprout" flour with a trademark?!! Can you really trademark a sprouted flour? I guess the wheat must be unique or failing that they are simply trademarking the snappy strap line "super sprout". If it's the latter then that's pretty darn sad. I don't know about that, they are a pretty small company compared to the big ones out there, have a mill and some silos and a bit of history. Not much else, no grand office space, no expensive cars in the lot. What I do know is the end result for a first attempt was great and I am pleased to have a mill close by to get unbleached, unenriched flour at a decent price. I believe the sprouted flour from KA is theirs as well as some of the organic whole wheat. If you are sad about that buy the same exact flour from KA and pay for more for 4lbs. than what I pay for 25lbs. How much did you pay for your "supersprout" flour if you don't mind me asking? I accept that sprouting grains add a little extra effort in the flour making process, though on a commercial scale it can't be that much of an overhead, just wetting some grain and then drying it. Yet I perceive that the prices these suppliers are asking for this little bit of extra effort is . . . astronomical . . . and in no way represents that small effort. This is saddening on many counts and not lest because it meansm, as ever, that the poor man wanting to eat more nutritional and healthy foods, is having to pay more and more for it. The the rich get healthier and the poor in many cases continue to eat less healthy foods. I appreciate there is always choice, always, but circumstances drive many people's needs and thus having access to something like sprouted flours is likely a luxury they can't afford, unless they do it themselves. For myself, if I were a producer of food, and could make my products more nutritious and healthy, then I would do so at no extra cost other than to simply cover the additional costs of producing it. Asking a huge premium just because it is more nutritious is imo morally wrong. the price of sprouted vs non-sprouted can be up to 5 times the price which is frankly a huge rip-off and imo immoral. I would personally not support any producer charging those kind of price hikes, either for their sprouted flours or any other products. As a society, what we need are good honest producers of food where improving the nation's health is the primary objective rather than making huge profits. The jury is currently out for me as to whether this current "sprouting movement" is driven by health and nutrition or by profit making opportunity. The price difference was marginal, $2 additional for 25lbs. Picked up at the mill, it was around $18 for a 25lb bag. Your quote of $18 for 25lb equates to 72 cents per lb which seems squiffy to me. No special customer, just a home baker, placed the order by phone, picked up the flour by appointment a few days later. My previous post stands as written. I am unable to find a definitive price list for Lindley Mills flours anywhere, not even on their own website which seems a little odd but I guess most farmers/millers are more about the agriculture than IT. Do you have such a price list? I can only imagine you were given a great and much reduced price because you turned up in person and were just a home baker. I can't understand the huge prices I see for sprouted flours across the internet, it makes no sense to me. also that if Lindley Mills is happy to sell you 25lbs for just $18, it is pretty shocking if they are knowingly sitting there whilst King Arthur are selling it for $8.95 per 2 lbs on their website, which would equate to $111.86 for 25lbs ! Something is badly wrong here. on their pricing of sprouted flour. They only charge that much because they can get away with it but they aren't making any friends - I buy wheat berries at the most expensive place possible - Whole Foods - who charges $1.19 a pound - more than twice what i pay at Winco at 56 cents a pound so KA has quite a mark up and profit on their sprouted flour:-). tasted terrible. I wasted a lot of money on it. Everything I baked was funny flavored. I thought the flour was very thirsty and I had to use a lot of water. I would rather make my own if I use sprouted flour in the future which I probably won't. I can't see any reason for it. At least if I make it myself I know what is in it. 1 x 25lb bag of Supersprout $19.25. Looks like tax was included in the price because that is what I paid in cash. I hope Lindley don't read your posts, but hey they will probably forget by the time I need more flour. And, you can get it in a tanker, or buy a number of pallets. What you all are missing is retail and middle man markup. I have not tried the white flour yet, but if it is anything like the Supersprout I will be in heaven. for the price check. Like I said, I think you got a great price. Not just a great price but crucially a FAIR price imo. I would accept a slight premium over the non-sprouted equivalent for the extra processing to sprout the grains, but I think premiums in the order of mutliples of the non-sprouted price are simply wrong and most certainly won't lead to any bread "revolution". What are your own thoughts on the "retail / middle man" markup as you put it for the KDL price or the KA price? I am not 100% sure, but I believe KA Sprouted is this same flour. They have to re-package it in a zip lock retail bag and label it, not sure how they do that? One should probably look at their overhead recovery, carrying the inventory and what their infrastructure costs are to get it to the consumer. It is possible that this is a low volume high margin premium product for them. Take note that Costco over here sells a 50lb bag of bread flour from Conagra mills for $16.46. It is bleached and I am working away my last bit, but it bakes a pretty good bread. I posted somewhere else doing a test with this flour compared to KA unbleached and there was really no difference in rise, crust, crumb and taste. The mill has no distribution costs, as the customers arrange the transport, these costs plus mark-up is added by KDL as the distributor. It seems the moment we go into small packaging, prices go high for the retail purchaser. I am also sure that if the sprouted flour is supplied in a tanker for re-packaging by someone else the price would be a lot less than what I paid, at the mill. You can set the sprouted grains with a simple fan. It just takes longer. Don't despair! What temperature are you drying in a dehydrator ? I have the same problem gummy center . Maybe drying at 95* to 105* is to low and berries are still sprouting by the time they dry? Maybe at a higher temp will stop the sprouting processes quicker. No, don't raise the temperature or you will end up malting the grains. Thanks so 95* is good ! Tony, I have a combi oven with convection heat, at 90, it takes too long and the berries continued to sprout. I just did another set at 100, and it still took a long time, but they did not continue to sprout. I haven't finished my tests yet, but I am guessing that is the biggest factor it getting a good product. I tried milling the "oversprouted" grains at a coarser and fine setting last week, and did not see any difference in the product. I may get a chance to try this latest batch ( dried at 100 to 105 F ) and I am hoping for better results. I have seen a number of different references which say not to go too high, but they use different numbers. 130 is commonly referenced. Reinhart says room temp or slightly above with a fan blowing air. He suggests that a gas oven with a pilot light which would be too warm. Layla, you are making the master formula on page 63, right? I just checked, and yes, the volume measurement in cups does not agree with the weight measurements in grams or ounces. Using ounces of water listed, and converting to cups of water, I get just over 1 3/4 cups. As to your overall question, are you using home sprouted flour, or did you buy it already sprouted? When i brought sprouted flour, and using the gram measurements, the dough started a little sticky, but was a normal texture midway through the stretch and folds, and was not at all sticky when I went to form it. I have had a host of troubles when sprouting the berries myself and grinding them using my own mill. I am close to believing that I oversprouted the berries, which caused the flour to have very little strength, and the dough was overwatered to an extreme degree. I think my main problem was the method I used to dehydrate was not quick enough and the berries continued to sprout. I have one more batch of flour to check this theory, but that is where I stand now. I dehydrated just after seeing the sprout braking the berries . Not a tail at all just a white dot. NG loaf flattened in oven & very gummy inside . I used a scale for all my measurements for Peter Reinhart's Sprouted Whole Wheat Bread. First rise was good divided and shaped. Proofed was not 1 1/2 times rise in 60-90 min. Checked finger test pt in oven and flattened to 2''. Also the Volume on the sprouted pancakes recipe in book is wrong. Butter milk 1 1/2 Cups = 365gr recipe on gr is 340 i always use a scale . Hi all, I'm a fan of Peter's and have tried this recipe twice now, once using sprouted WW flour from Carolina Mills and once using One Degree. 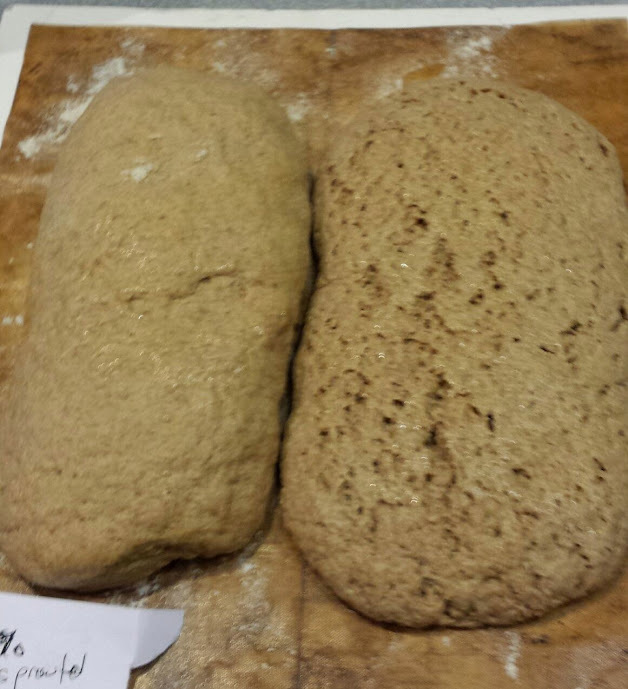 Both times, the loaves have been very hard to shape into boules (is there a video anywhere?) and both have come out very very flat, with no oven spring whatsoever. Am I overproofing? How do I know? What can I try, what can I do? I hate to give up on this (and I can make really great loaves using traditional flours and his other books ... but I am discouraged and I don't know what to change. Thanks so much. I admit that I have real trouble determining when "the dough increases in size by 1½ times" in that final proof -- I'm using a banneton -- and I thought I understood the "spring" test with a finger but maybe I don't have the hang? Should I just bake after a hour? I think I've been going about 1:15. Or should I do a boule or loaf? I am no expert in judging when it is properly proofed, but one rule of thumb I use is to proof it for 1/2 the time it spent in bulk fermentation. One other option is to pinch off a small piece of dough when you are forming the loaf, and put that in a small, clear container with straight sides ( like a contact lens solution container ) it makes it easier to judge when it has increase 1 1/2 times in volume. The contact lens container Idea is a great one. As is the 1/2 the bulk fermentation time "rule" -- let me give those a try and I will report back. The taste and mouth feel of bread and pita made from just ground flour is very fresh. chew. i think I will try the sprouted grain recipe above. bread is that the flour is less thirsty than regular grain and that it moves much faster for ferment and proof. Once I got it figured out it makes the best tasting bread ever. Now you need a dehydrator to dry the sprouted grains before milling, I dry mine at 105 F for 3.5 hours and the grains weight he same as they did before I sprouted them. Wow, I am thrilled at getting a reply! I do have an old small dehydrator. I measured the temp and it was 140F and there are no adjustments. Will that be too hot? Keep in mind if you are going to try the 100% sprouted grain recipe it is very tricky and the timing is extremely important. If you mix only a % of Sprouted wheat in with non-sprouted wheat it is much easier to bake with and I find it doesn't effect my procedure very much at all. You want the temp to be 100 degrees to 120 degrees. 140 may be too hot but DA can speak to that as well. I just tried this recipe for the first time today. I used One Degree sprouted flour. I used the amounts given in this post, but the directions given in the BBGA newsletter from a few months ago. I was sure this bread would never turn out, seeing as there was little strength to the dough and it was utterly slack and wet after mixing. However, 4 stretch-and-folds later, I saw a small amount of strength and elasticity. I originally divided the dough in half for pan loaves, but I quickly realized there was no way the amounts given in this post would make 2 pan loaves, and I was right. I put all the dough in one 8x4" pan, and let it rise to just above the rim. I put it in a preheated 470 degree oven, because those were the directions in the BBGA newsletter. However, after consulting this post again, I turned the heat down to 375 degrees about 20 minutes into the bake, and I tented the top to limit browning (although it really didn't need it). I baked to an internal temperature of 190 degrees, and I had no sinking. However, there was virtually no oven-spring either. I did not use steam. I did add about 2 Tbs. of honey to the dough, as I thought it tasted a bit salty, and I am glad I did. With all the hype about sprouted wheat, I guess my expectations were pretty high for the taste of this bread. I am sorry to report that I am disappointed. It's not that the bread tastes bad (it doesn't), it just doesn't wow me at all. In fact, it rather reminded me of the "brown bread" you get in the UK, which I was very surprised to find that I do not like at all. It is very dense, although not gummy as some have reported, and just doesn't have a great texture. In short, I don't think I will make any more of it, given that the flour is not easily available and costs quite a bit. I can't seem to figure out how to add a photo of the bread to this post. Otherwise, I would show you pictures. Corinaesq- I just want to let you know that though I had some success with the One-Degree sprouted wheat flour in the sour dough loaves, I found that i prefer using it for the quick breads ( particularly the muffins) that are in PR's book. So at least you could try making some of those recipes with your leftover flour. Thanks, Caryn! I just ordered the book from the library. 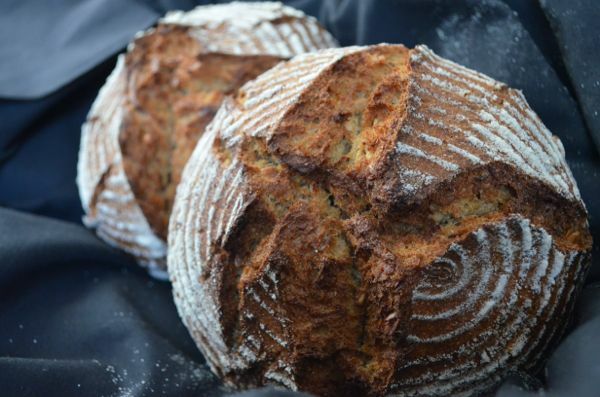 What did you think of the sprouted wheat sourdoughs? To be honest, I was not blown away as the hype in the book led me to expect. I respect Peter Rinehart, but these loaves were not as interesting to me as the other sourdough breads that I have been making, plus I could use less expensive whole wheat flour in the other breads. The sourdough breads in "Bread Revolution" are a bit more finicky than other sourdough breads, so that is the other reason I stopped trying them. I would, however, be interested in your experience. I will let you know when I have tried some of the sourdough recipes, but I suspect my reaction will be the same as yours. I really was hoping that this flour would be everything it was "cracked up" (pun intended!) to be, but alas. Have you (or anyone else on the list, if you are reading this) ever used hi-maize flour? Hi Corinaesq- I have only seen it listed on the King Arthur site and believe it might be some manufactured fiber. I don't really care for ingredients that don't seem natural, so I never looked into it. Hi, Caryn! Actually, hi-maize flour is made from corn flour in a process that results in higher fiber content without an unpleasant change in texture, and it has probiotic qualities as well. I have tried it in my "go-to" artisan bread recipe, and so far it has affected the hole structure I am used to getting (the holes are much smaller), but it hasn't affected the taste. I suppose it might be better in baked goods that generally have a finer crumb, like cakes and muffins. I will try the hi-maize in those things next. Very moist, makes great toast! I made an artisan loaf using King Arthur sprouted whole wheat flour. I found the result to be very moist. Because it's so moist I like it better as toast than untoasted. 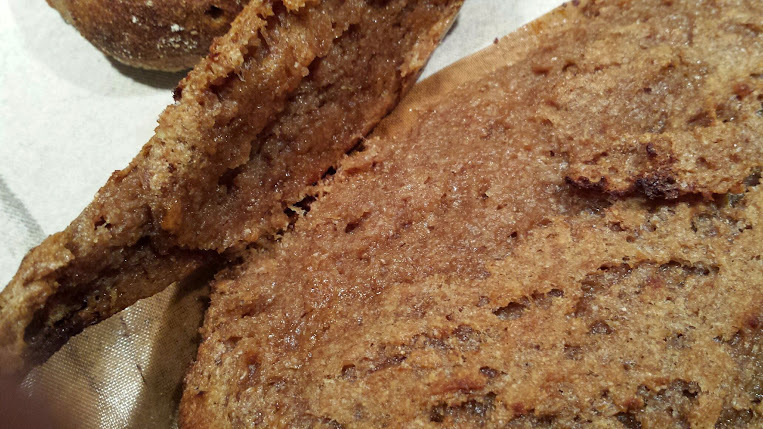 I added no sugar but the toast has a slightly sweet, nutty flavor. Reading this thread makes me think I may have erred in choosing this book and this recipe as the one to use for learning to make bread! It is comforting to see that others have some of the same troubles I've had. Overall it seems like I get much better results with this recipe from baking mini loaves in my soup bowls than from baking in a normal loaf pan. I haven't tried a sheet pan yet. It is very very difficult for me to tell how long I should do the bulk ferment and how long I should do the final proofing. If I take the full 20 minutes in between each stretch and fold, it seems like the dough is already almost doubled in size from when I first mixed it, and it's full of large bubbles. The 1st full-sized loaf I made was massively overproofed (collapsed after coming out of the oven and only the top was edible: the base was a solid gummy mass). The second was also overproofed but not as bad. It deflated when I slashed it but the bread was still very nice to eat, even though it had a valley down the center where the slash had deflated it. The third was underproofed. It looked nice outside but the crumb was very dense and gummy. The 4th is in the oven now. I tried to lean towards overproofing and I didn't slash it at all. The top looks flat and has big bubbles. I'm going to bake the hell out of it and make sure it's at least 210F inside before I pull it out of the oven, and then let it cool resting on it's side to hopefully prevent it from falling! I went all-in and ordered one of those new standalone Mock grain mills, so after I use up my 25lb order of sprouted whole wheat from To Your Health I'm going to switch to fresh-milled unsprouted, with long retards or with sourdough to get the nutritional benefits of sprouting. I don't think it's the fault of the flour that I'm having difficulty, I just am such a novice that I really am having a hard time recognising the different stages of the dough's leavening. Oven temp reduction for sprouted flour? Thank you kindly for the add. I'm a newbie to bread baking and am loving this site. I watched a sprouted wheat bread seminar that Peter Reinhardt gave on youtube- at some point near the end, someone asked him if the higher temperature of baking would destroy the health benefits of sprouted flour. He was not able to answer the question, and said that he was looking forward to someone providing tested data on that topic at some point. It seemed a bit awkward. Today I purchased a bag of One Degree sprouted flour at Whole Foods today, and after I got home I popped onto their website. I sifted through the comments posted underneath their own bread recipe, and one of the commenters also questioned that sprouted wheat might perhaps lose its beneficial properties if heated up to 350 degrees. She inquired if they had an altered instruction that would allow one to bake at 250 degrees for a further extended time. One Degree responded that they didn't yet have altered directions for a lower baking temp, but that they'd share one soon. Does anyone have any experience on baking bread longer at a lower temp such as 250? Thoughts on this, or baking bread at lower temps for an extended period of time? I realize this thread is rather old and things have changed a bit since most of this was posted, well not peter reinhart's book, which is amazing. I have made quite a few breads from his book, most notably with Supersprout flour. Lindley Mills makes the tastiest astounding flour I have ever had and yes, its that cheap. I haven't asked about what kind of wheat they use but I'm sure the answer would be some antebellum wheat variety. Anson MIlls also has wonderful antebellum flours that deserves to be shared . Yes shipping is the kicker for both here but malting my own wheat is too much work . I have tried the ONe Degree flour and did not find it near as tasty as either of the aforementioned flours but I know Anson and LIndley flours are milled pretty much on demand so are very fresh. KDL foods sell the flour in bulk, 23 for the flour ( 25lb) and 23 for the shipping ( to NY) Still can't be beat for taste. I have made rolls, bread, PIzza, pitas ( omg good ) and cookies using only supersprout flour, SeasideJess I have had NONE of the problems i read about here. Check your oven temps? I do at least 24 hr cold ferment in the fridge though so maybe thats the difference?